According to studies recently published by Vilgalys, Pleurotus pulmonarius is virtually indistinguishable from P. ostreatus, and differs largely in its habitat preference for conifer woods. In the Western United States, P. pulmonarius is usually found at higher altitudes than P. ostreatus which prefers the lowland, river valleys. P. pulmonarius and P. ostreatus grow on a variety of hardwoods, with P. pulmonarius primarily a spring mushroom and P. ostreatus growing most prevalently in the summer to fall. The North American collections, show a wider range in color than the European collections. P. pulmonarius hosts a large complex of varieties, offering cultivators a rich resource for new strains. Most of these strains fruit in culture. Mycelial Characteristics: White, linear, becoming cottony, and eventually forming a thick, peelable, mycelial mat. If cultures on agar media or on grain are not transferred in a timely fashion (i.e. within two weeks), the mycelium becomes so dense as to make inoculations cumbersome and messy. Over-incubated cultures can not be cut, even with the sharpest, surgical grade scalpel, but are torn from the surface of the agar media. Microscopic Features: This mushroom produces white, to yellowish, to lavender grey spores. Suggested Agar Culture Media: Malt Yeast Peptone Agar (MYPA), Potato Dextrose Yeast Agar (PDYA), Oatmeal Yeast Agar (OMYA), or Dog Food Agar (DFA). Spawn Media: Grain spawn throughout. Yield Potentials: Biological efficiency 100-200%, greatly affected by the size of the fruitbody at the time of harvest and whether of not a fourth or fifth flush is achieved. Every 7-10 days, for 3 flushes. Comments: This species complex hosts an enormous number of strains. The most popular are the warm weather varieties currently being marketed by spawn manufacturers, often under the name "Pleurotus sajor-caju". 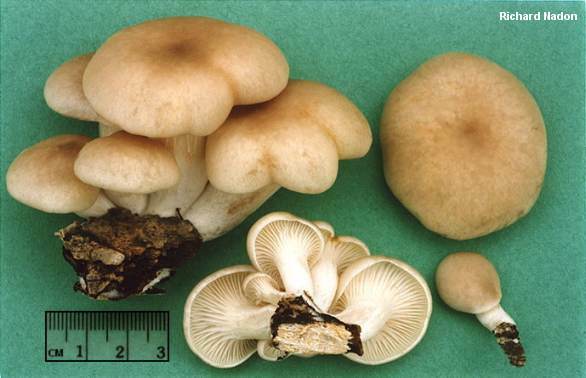 This mushroom is more widely cultivated than any other Oyster mushroom in North America and Europe. production of high spore loads. These may be merely the complaints of a critical connoisseur. Many people use and like this species. P. pulmonarius remains the favorite of many of the largest Oyster growers in the world, especially those located in warmer climatic zones. Okwujiako found that the vitamin thiamine was critical for growth and fruitbody development in P. pulmonarius. By simply adding yeast extract to the base medium, vitamins essential for enhanced fruitbody production are provided. The habitat of this mushroom is characterized by a rather narrow area. However, this can be compensated by its high yield.